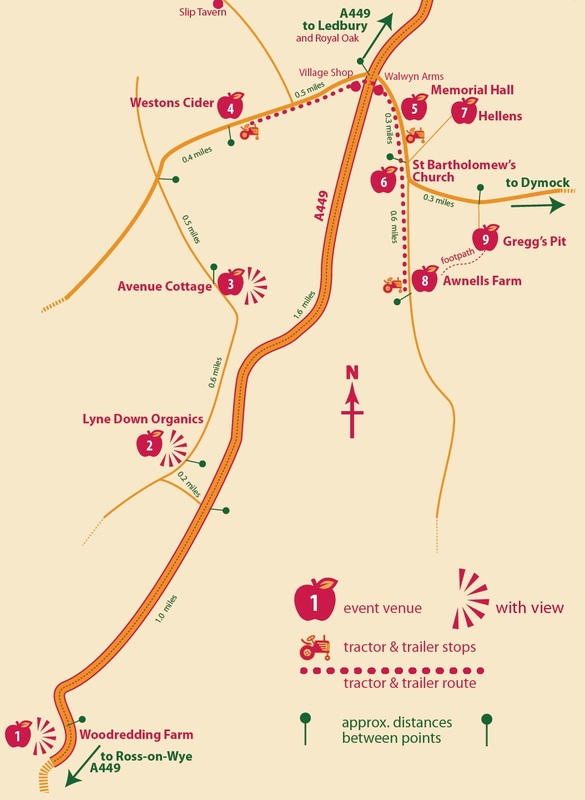 Most venues are within walking distance of each other – eg the walk from Hellens to Westons Cider or to Awnells Farm takes around 20 to 30 minutes. A tractor and trailer service will operate between Westons Cider, Much Marcle Memorial Hall (for Hellens and St Bartholomews Church) and Awnells Farm (for Gregg’s Pit). Woodredding Farm and Avenue Cottage are slightly further away – the walk from Westons to Woodredding Farm via the ‘top’ road past Avenue Cottage takes about an hour. Please note that access to Woodredding Farm from the top road is only available on foot and not by car. Westons has a large tarmac car park and there is a large field at Hellens for parking. Parking at other venues is more limited. Some field parking at Avenue Cottage and Lyne Down and there’s a small car park at the Memorial Hall. There are only two or three spaces on the road by St Bartholomew’s Church so please leave these for people with blue badges. Gregg’s Pit has parking in a large field, but the access lane is very narrow – so be prepared to reverse if necessary. Awnells has parking in the farmyard but do take care as this venue is popular with children. We would ask you to be considerate to Much Marcle residents and not park in residential streets. Please think about parking at Hellens or Westons and then walk to the other venues, or use the tractor and trailer service. There are no weekend buses to Much Marcle from Ledbury so the only option apart from cycling from Ledbury at the weekend are taxis – there is a list of current operators at the railway station but no taxi rank so you will need to phone for one. You may be able to take a bus from other Herefordshire locations but the options are very limited. See https://bustimes.org.uk/localities/E0053319 for possibilities.